President Rody Duterte in jest calls him "Ambassador Extra-Ordinary" because he is tasked to receive calls and deal with the mighty and the powerful who seek audience with the President. To many who have followed him in the Social Media, he is the Pambansang Photobomber. To some, he is the Presidential Shadow whose presence in a room indicates that the President will appear next. Christopher Lawrence Go, however, is more than just those funny descriptions. 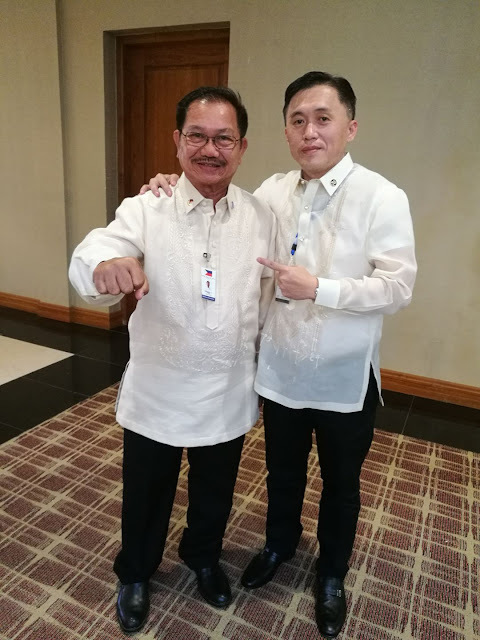 Through the years since he served then Davao City Mayor and later President Rody Duterte, Bong Go, has metamorphosed from just being a young executive assistant to becoming one of the most powerful personalities in the Duterte Presidency. When Bong Go issues orders and directives, you can be sure that those came from his Boss, the President. Even with the immense influence and power that he wields now, Bong Go has remained humble and even taciturn at times. His subdued personality fits perfectly with the strong character of the President and this perhaps explains why, Bong Go is trusted by President with almost everything including his life. Today, after a long while, I had the chance to pose for a picture again with Bong Go. "Post nimo Sir sa imong Facebook page kay daghan kaayo naga-follow," he asked me. Such a humble request from a guy who virtually is the mouthpiece of President Duterte. How can you not admire and like this young man?